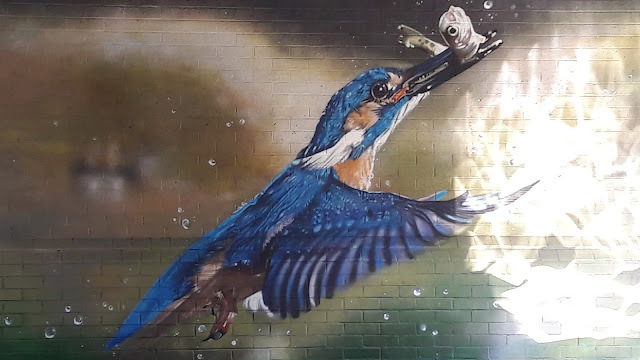 The Trap Grounds kingfishers are renowned enough to have an entire nearby mural dedicated to them, in spite of their somewhat reclusive nature and rare appearances. They are also - despite their brilliant plumage - masters of camouflage. Sometimes I've caught the briefest glimpse of bright orange and blue, only for it to disappear, within a second, into the surrounding foliage, leaving me staring intently and with receding hope of a reappearance, wondering how such glaring, vivid colours can merge so successfully into greenness. I've never yet been privileged with a sighting of a kingfisher contentedly on his perch or diving for fish; but then, I've never spent hours waiting and winning his trust and favour. But there was one evening, a month or so ago, when I was blessed with a triple sighting; one evening when I'd had a rough day, and, feeling disgruntled, had decided that a quick walk in the evening sun might do me good. I wandered by Swan Pond, reflecting that the swans - creatures of habit - were unlikely to be there at this time, and all I'd see would be coots and moorhens. And then, as I approached, I saw it... that flash of iridescent blue, flying towards the overhanging willow from which - I suddenly remembered - others had seen the kingfisher dive. A surge of joy and lightness coursed through me, even as I stood immobile, focussed on the branches into which he had disappeared. How could such beatitude be possible, in the midst of my now dispelling grumpiness? And then, several minutes later, bright blue wings circled the tree and vanished into the greenery, seemingly changing colour in the process. In the space of those few minutes I'd seen more kingfisher than in the previous six months! I continued on my walk, my spirit lifted, just as the pictured sign promises. 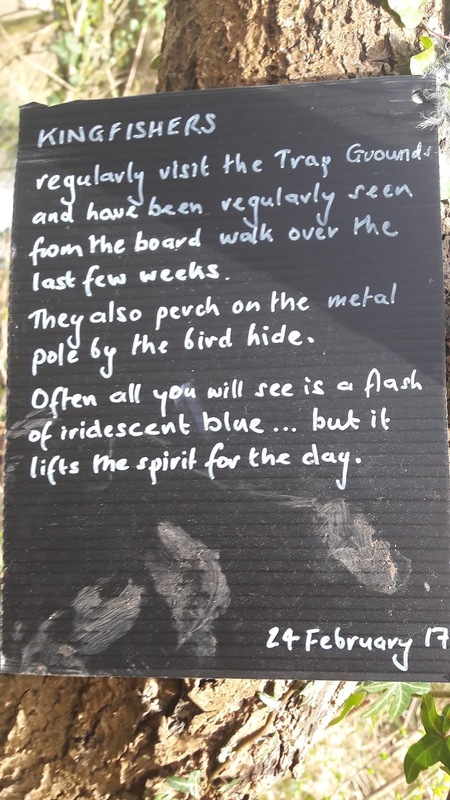 On my way back, on a whim, I headed back towards Swan Pond... arriving just in time to see radiant blue wings, launching themselves and skimming low over the reed beds, flying into the distance. Three times in something like thirty minutes! Of course, the kingfisher wasn't there the following evening, or the evening after, or indeed any day or evening since. And why should he be? He has his own life to lead, his own needs to respond to; my desire to gaze at him and take photos and be able to say I've seen him dive for fish isn't his prime concern. And as I come to the end of my time here in Oxford I know I'm unlikely to have that joy; but I also know that seeing the kingfisher isn't my only reason for visiting the Trap Grounds. Nevertheless, I stop by the bird hide, Swan Pond and elsewhere; stop and watch and wait. And I recall a poem by Ann Lewin, and ponder the precision of her analogy. Yes, there is a rightness to this analogy, but there is also a fundamental difference. Seeing or not seeing do not matter - have never mattered. The rare brightness is lovely to behold and to experience, but it is not the reason why I pray. I pray simply to spend time with God, not to wait for spirit-lifting sightings, gratuitously lovely though they are. Even without them, I know God's presence and God's love: it is within and around, in the small, dull and colourless as much as in the iridescent; in the often overlooked and ordinary, as much as in the more dazzling and breathtaking. My knowledge is not that God has been there and may come again, but that he is here, and always will be. This is my encouragement, my joy; and for this I feel immense gratitude.